We want you to paint something that you enjoy, so choose a design from our Gallery or send us a personal photo of your pet, a flower from your backyard, a view from your last vacation or anything else that inspires you! You may also find pictures or famous artists online, in public domain. 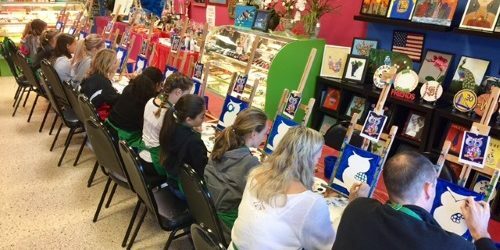 We will sketch the canvas for you prior to your session so you can focus on the fundamentals of painting with acrylics and have fun! Discover your own creativity and artistic ability through the therapeutic and relaxing benefits of painting while listening to your favorite music at the studio. Whether you are young or simply young at heart, Color Bundles is the studio where everyone can discover the joy of art creation. Smile is guaranteed for all the beginners! Once you select the artwork ( GALLERY), please email it to us at least one week in advance, so we can sketch the design on to a canvas for you prior to your session. Acrylic paints, an 11 x 14′′ pre-sketched canvas, brushes, easel, an apron and one on one instructions. Each session is 3 hours for $45.00/Person. Extended hours are also available at $25.00/hour, if needed. Kids ages 7 – 9 may paint on 8 x 10″ canvases for $35.00/Person. Please contact us for more details or any questions. Come and paint at Color Bundles! Please contact us at least one week in advance to book a 2-3 hours session, any day from Wed – Sat. We accommodate large group of 12 or more on Sundays and 10 or more on Saturdays, 11:00 – 4:00 pm. To secure your space, a deposit is required at the time of reservation.